PESA Member John Daniel, Simmons & Company, speaks at the PESA Value Proposition Breakfast held December 8, 2016. PESA held a value proposition breakfast with market outlook in December to introduce prospective members to the activities and benefits of the Association. Prior to joining the Simmons & Co., John Daniel worked for Key Energy Services for eight years, most recently as vice president, corporate development. His responsibilities included investor relations and mergers and acquisitions. Daniel also spent four years as an analyst with PNC Bank, serving in its corporate banking and leverage finance groups. The most recent U.S. land rig count stood at 5757 rigs as of December 3, 2016. The working assumption is that we exit 2018 at ~950-1,000 rigs. If, however, we see a more expeditious rise in oil prices, it is likely that rig activity will accelerate more quickly. A key question remains the impact of drilling efficiencies and how it relates to future rig count gains. Mitigating this concern is the ample number of low-priced, idle drilling rigs. Specific to oilfield service, Daniel stated that E&P CapEx spend is estimated to increase over the next two years and that oil service pricing must inflate due to sizable increases within the pressure pumping and frac sands markets as well as unsustainably low margins within all oil service product specification levels. 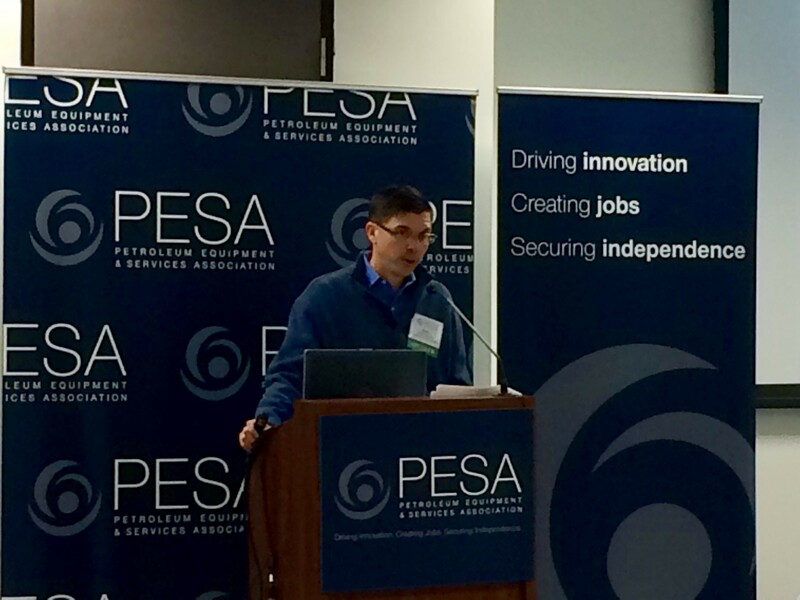 Attendees from more than 40 companies met senior leaders in the oilfield service, supply, and manufacturing sector and learned how PESA membership can benefit their company. If you know of a company in the oilfield that would benefit from PESA membership, please reach out to Peggy Helfert at phelfert@pesa.org.